Bench Chair Umbrella and Torch Clamp There is 1 product. Porti'tou has created a clamp for parasol or garden torch, a real alternative to parasol foot. It preserves your lawn, does not harm your furniture and moves very easily. Very clever, this umbrella holder allows you to also accommodate a garden torch. 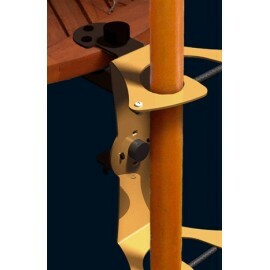 It is fixed on a horizontal as well as vertical support, in a safe way! Move your sun umbrella as you like !